Relief to see Aboubakar Kamara emerging from the bench is never the hallmark of a great gameweek and so it proved as I returned my third successive red arrow. That was in spite of having 6/11 returners in my team with all of my defenders supplying points, but the highest score amongst these was only 7 from Doherty. There are several problems in my team and I am looking to address some of those with only my 3rd hit of the season. My continued faith in the premium trio of Aguero, Salah and Hazard over the last few weeks has cost me as they have been heavily outscored by alternatives such as Aubameyang and Sterling. Therefore, I have elected to remove two, Hazard and Aguero, from my team to be replaced by Kane and an in-form Sané. Hazard and Chelsea just don’t seem to be in the same attacking form recently and I worry that Aguero’s minutes will be managed over Christmas which is why I have decided that they need to go. Meanwhile, Spurs have some great upcoming fixtures and Kane provides a truly nailed-on option in this time which means he can be trusted with the captaincy. My other issue has been with the differentials in my team who have not been delivering in recent weeks with Barkley and Martial proving particularly problematic. I am willing to give the United man another couple of weeks as his fixture list still looks strong, but I have now run out of patience with Barkley. 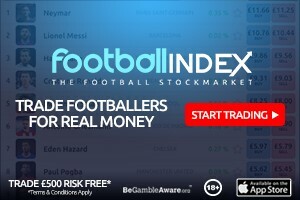 Therefore, I have decided to bring in Felipe Anderson who is showing some scintillating form in becoming a key man for West Ham who have some tasty fixtures coming up. 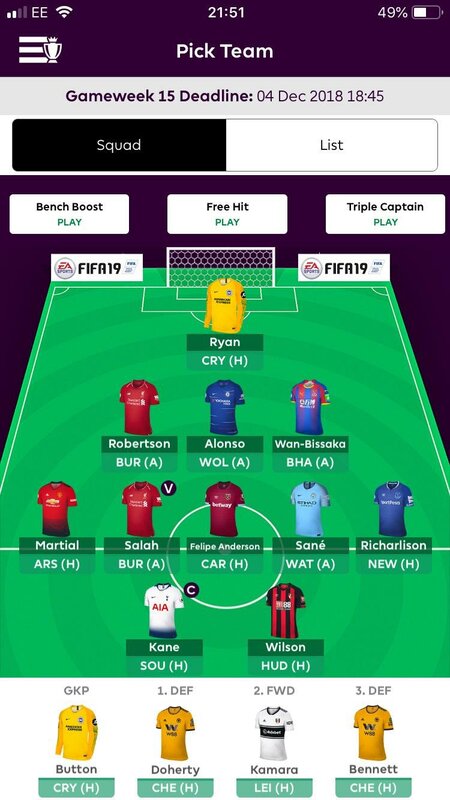 My transfers this week have created a captaincy dilemma as Kane will be vying for the armband with Salah which brings back memories of last season. The Burnley defence has been appalling recently, conceding 27 more shots in the box during the last 6 weeks than any other side which makes the Egyptian very tempting. However, Kane is looking much sharper lately with returns in the last 4 weeks and a home match against manager-less Southampton is hard to resist so he takes the armband for now. Best of luck to everyone this midweek and may your arrows be green! Kane, Anderson, Sané in for Kun, Hazard and Hojberg for a -4. Good luck all. Hi! Lamela is yellow flagged! Check first if he could play tomorrow. Anyway, beeing Kane the most selected captain option this GW, personally I would go for him(boring movement though) . My advice would be to just bench Neves for now and get on the Kane train. If I transfer in Kane for Aguero, I’m at -1.1m. Can’t do Robertson to TAA. My only option is transferring Hazard out, but for whom? Tried to get a frontline of Awba, Kane and Arnie by downgrading Hazard but I wouldn’t have enough funds for a midfielder that way. Thoughts? 1 FT with 0.1 ITB. 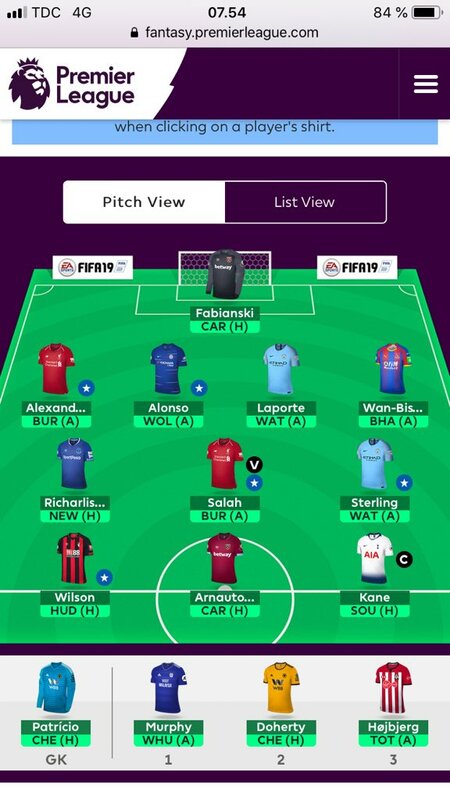 I have Aubameyang, Sane and and Salah as aces, considering swapping out Salah for Kane (and Arnautovic for Anderson) please advise. Depends on your rank. I see it as a somewhat defensive move (captaining Kane will protect rank if he scores a couple). Personally I wouldn’y do it as both Arnie and Salah have great looking fixtures. 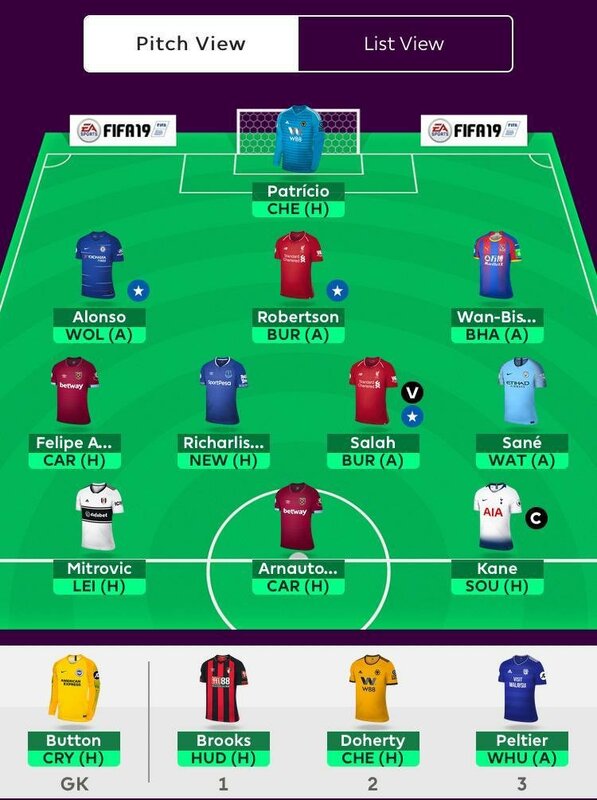 I wildcard this week even though I got 73 points last week thanks to having auba as cap. Basically I got rid of firmino, martial and Willian and brought in pogba, Kane and kouyate. I reckon kouyate is a good bench option. He’s due a goal now that he’s started the last 6 games and is cheaper than the suspended capoue. I kept lacazette, Sane and Anderson. Defense wise I got rid of Laporte and Mustafi and bought in Digne and Diop. Will probably change it before the deadline a few time. What do you think… Firmino, lacazette or morata? As for swapping Arne to Anderson I’d say definitely do that. As a West ham supporter I’ve watched ever game ti’s season bar 1 and Anderson I really finding his feet in the pl now. Arnoutovic is having lots of off days recently.